Abused Backyard Breeding Dog Finds Loving Family In Lap Of Luxury! After starting her life as an abused breeding dog and then dumped at the Riverside shelter with multiple medical issues, we are pleased to announce that Razzy has chosen her forever family! 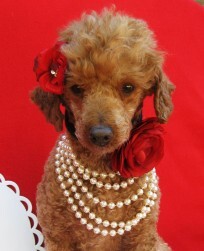 Our little Razzy, now named Coco, has traded her dingy shelter digs for a luxurious home in Newport Beach. This prancing diva is now living the high life along side Lovebug, Sophia and brothers Charlie and Kobe. This pair of princess pooches can often be seen strutting their stuff at Fashion Island all decked out in matching pearls and tutus! Her story is not an unusual one unfortunately! Now that she has recovered and found a loving home she could not be happier! The all too common story of a puppy mill mommy is a sad and lonely one. Razzleberry and thousands of dogs like her, are kept in kennels their entire lives with the sole purpose of delivering litter after litter of adorable puppies that are sold for thousands of dollars in pet stores throughout the country. Because the medical care of these dogs cuts into the profit for the breeder, they sadly do not receive even the most basic care they need. At 6 years old, Razzy was no longer a profitable breeding dog and was dumped at the Riverside Shelter. 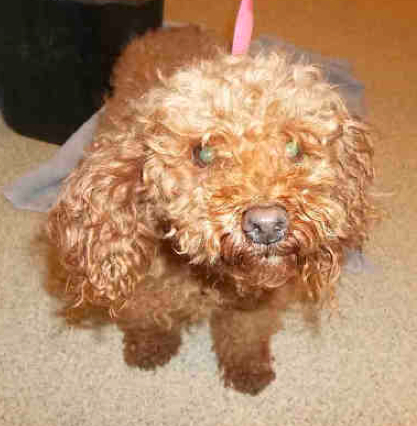 She was never groomed, bathed nor had her teeth cleaned. As a result, Razzy has suffered broken and missing teeth from chewing the bars of her cage. 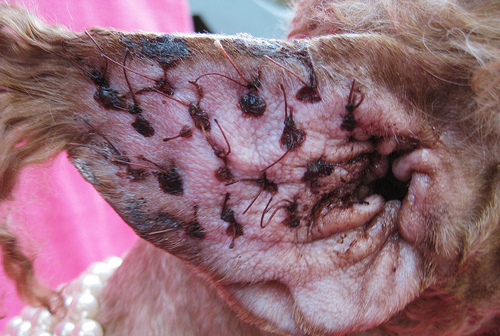 She has likely had a painful ear infection most of her life as her ear canals have narrowed and hardened. We also think that poor Razzy was “debarked”. To make matters worse, she had a very large hematoma on one of her ears that was engorged with blood that required extensive surgical repair to remove. Razzy underwent surgery to not only remove the hematoma, but also had several teeth cleaned, a mammory mass that was removed, and she was spayed.